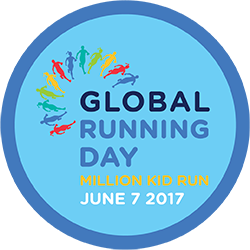 Run at least one kilometer on June 7, 2017 in honor of Global Running Day! A day for people around the world to celebrate the joys of running. Participation is easy - just pledge today, tell us why you're running, and take part in some type of running activity on June 7, 2017. It can be a solo lap around the block, a long run with friends, or even a family game of tag. When you make your Global Running Day pledge, sign your kids up to be part of the second-annual Million Kid Run. Note - you will not show up on the Challenge Leaderboard unless you complete an activity over one kilometer. To ensure you meet the Challenge goal, we recommend you run a small amount over one kilometer during your activity. This will give you a buffer in the event your activity distance is shortened after upload to Strava due to the cleanup of GPS irregularities. You can learn about how distance is calculated for our app by reading this Knowledge Base Article. There is no time limit to complete the one kilometer.